This Centre is the ideal workspace for start-up and growing companies, offering flexible, professional premises with a range of business support services needed during the first vital years of operation. The Centre is located at the gateway entrance to the new airfield business park in the pretty town of Market Harborough. The Centre can cater for up to 53 companies in a total of just over 23,000 sq.ft. of space. The offices and studios are ideal for companies with 1-20 people where they can benefit from a flexible office environment, high-specification meeting and conference facilities. The Centre has a range of conference and meeting rooms available to hire by the hour or the day by internal or external companies, catering for 2 – 60 people. 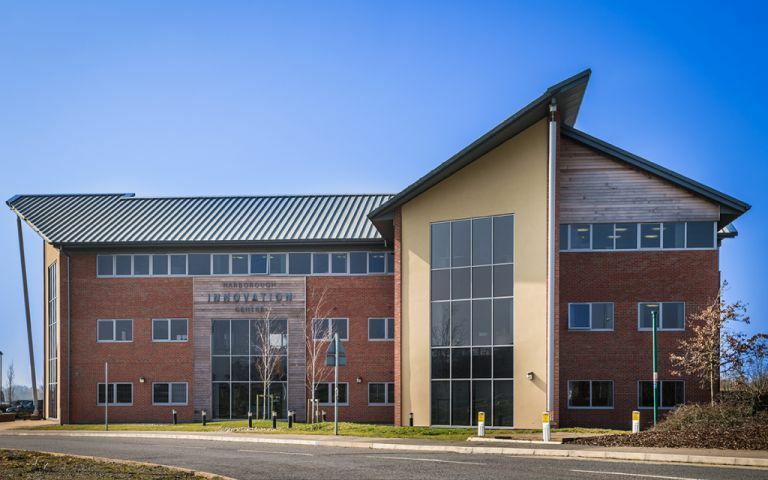 The serviced offices are located about 12 miles south of Leicester and about 18 miles north of Northampton. The centre has fantastic transport links to the north and south of the country via the M1 motorway and Market Harborough Train Station. Junction 20 for the M1 is a 15 minute (approx) drive from the centre and London by rail is reachable in approximately 1 hour. These offices in Airfield Business Park offer a range of prices depending upon your exact requirements. Contact us now and we will help find the best price for you, based on your individual needs.